We’re back with our predictions for the NBA Finals. So far, we’ve gone 1-1 with our picks, picking the Spurs in the first and second games. The series now shifts back to San Antonio for three games before heading back to South Beach for the final two. 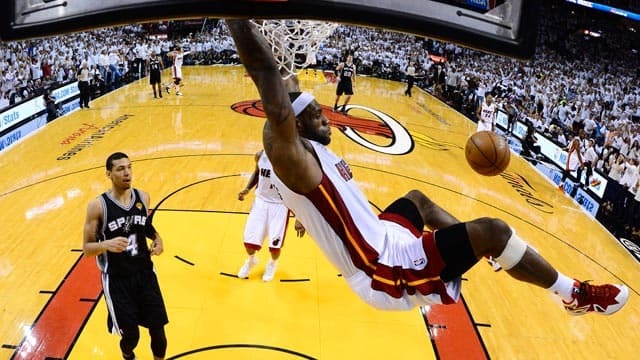 Game 2 was close for much of the game, but the Heat went on a late third quarter run that put the game out of reach for much of the 4th quarter. San Antonio led 62-61 with just under four minutes left in the 3rd quarter, despite poor offensive performances from their own “Big 3” of Duncan, Ginobili and Parker. From there, the Heat went on a 30-5 run before Greg Popovich pulled his starters with just under 8 minutes remaining the game. The Heat won 103-84, easily covering the -5.5 spread and keeping the total just under the 188 Over/Under mark. Game 3 is tough to predict, and we did choose the Spurs to win the NBA Championship in our series preview, but they will certainly lose some games on the way. We see these teams going 6-7 games before deciding the title. Obviously, a Game 3 with the series tied at 1-1 is a massive game for both teams. The key to Game 3 was the Heat’s heavy defensive pressure against the Spurs, which did not allow them to move the ball around and quickly check their options. Miami bothered Parker up the floor and did not allow him to quickly start executive offensive sets. The Spurs pick and roll was nowhere to be found, and this was all before the defensive meltdown of San Antonio late into the 3rd quarter. With almost all their key players having a poor game, the Spurs were still up one point until the Heat went on their run to blow out San Antonio. Let’s also not forget, the Heat shot just above 52 percent from three-point range, a much better number than their postseason three-point shooting percentage of 36.3. Greg Popovich knows he can not let Miami have free roam in the paint, something the Spurs did excellent in Game 1, but were less effective at in Game 2. Spurs’ defenders were caught in no man’s land between the paint and three-point line, which led to open drives and wide-open perimeter shooters. Surprisingly, LeBron Jams has been held in check scoring wise, scoring only 18 points in Game 1 and now 17 points in Game 2. Though he facilitated and rebounded well, the Spurs know how to contain him as a scorer – something that no other team has been able to do this postseason. The Spurs will look to get back to basics and clog the paint in Game 3. They will keep an eye on the Heat’s hot perimeter shooters, but will not make them a priority. They will not shoot 50 percent from three often and have actually been poor at shooting from downtown this postseason. The Spurs are right to focus on James and risk giving up open shots to his teammates. James had only 8 points and was 3-13 from the field after three quarters. If he has more stat lines like that after three quarters, the Spurs will win this series easily. We think the Spurs will rebound from their poor offensive performance in Game 2, as well. It was a poor shooting night for the whole team, but it would be nice if San Antonio got something more out of Ginobili. He has not been a key factor in this series yet, and perhaps the veteran Argentine guard will have a breakout game in his first game in front of his home fans. We like the San Antonio Spurs -2.